↑ Shabaab leader recounts al Qaeda's role in Somalia in the 1990s. Long War Journal (2011-12-30). یوْخلانیلیب2014-07-01. ↑ ۲٫۰ ۲٫۱ Mark Bowden (16 November 1997). Blackhawk Down. The Philadelphia Inquirer. یوْخلانیلیب25 August 2013. ↑ ۴٫۰ ۴٫۱ "Anatomy of a Disaster". Time. 18 October 1993. Archived from the original on 18 January 2008. Retrieved 19 January 2008. ↑ ۶٫۰ ۶٫۱ ۶٫۲ ۶٫۳ ۶٫۴ ۶٫۵ Bowden, Mark (16 November 1997). 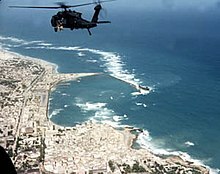 "Black Hawk Down: A defining battle". The Philadelphia Inquirer. Archived from the original on 1 July 2007. Retrieved 25 June 2007. ↑ ۷٫۰ ۷٫۱ Interviews – Captain Haad | Ambush in Mogadishu | FRONTLINE. PBS (3 October 1993). یوْخلانیلیب25 August 2013. ↑ ۸٫۰ ۸٫۱ Bowden, Mark (16 November 1997). "Black Hawk Down". The Philadelphia Inquirer. Archived from the original on 23 September 2006. Retrieved 25 October 2006. ↑ Cassidy (Ph.D.), Robert M. (2004). Peacekeeping in the Abyss: British and American Peacekeeping Doctrine and Practice After the Cold War. Greenwood Publishing Group. p. 157. ISBN 978-0-275-97696-5. ↑ Karcher, Timothy, Understanding the "Victory Disease," From the Little Bighorn to Mogadishu and Beyond (Global War on Terrorism, Occasional Paper 3), Fort Leavenworth, Kansas: Combat Studies Institute Press, p. 34, The Battle of the Black Sea was a tactical victory for TF Ranger, but a Pyrrhic one at best. It had gone into Aideed’s stronghold, captured two of his top lieutenants and numerous other subordinate clan leaders, and then withdrew with relatively light casualties considering the odds it faced. The Somalis, though, had suffered greatly as a result of the battle, with US military firepower inflicting an estimated 1,000 casualties, with at least 500 dead. Whether it may have been a victory at the tactical level, this battle signaled a failure at the strategic level of war. ↑ Bowden, Mark (1 April 2010). Black Hawk Down: A Story of Modern War. Grove/Atlantic, Incorporated. p. 348. ISBN 978-1-55584-604-6.